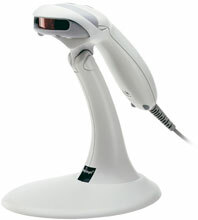 Metrologic MS9540 Voyager Barcode Scanners - Top Seller! MS9540 Voyager, PS/2 kit, 1D Laser. Includes PS/2 cable and stand. Color: Black. MS9540 Voyager, SCANNER ONLY, 1D Laser Scanner. CodeGate and Keyboard wedge Interface. Color: Black. Scanner Only - Cables and accessories must be purchased separately. These include USB (Part# 53-53235-N-3), PS/2 (Part# 53-53002-N-3), or RS-232 Serial cables (Part# 53-53000-3) and a Power supply (Part# 46-00525). Non-Cancelable/Non-Returnable. MS9540 Voyager, SCANNER ONLY, 1D Laser. Cables and accessories must be purchased separately. These include USB (Part# 53-53235-N-3), PS/2 (Part# 53-53235-N-3), or RS-232 Serial cables (Part# 53-53000-3) and a Power supply (Part# 46-00525). Color: White. MS9540 Voyager, SCANNER ONLY, 1D Laser, RS-232 interface. Cables and accessories must be purchased separately. Color: Black. 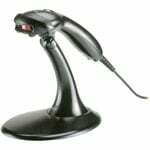 MS9540 Voyager, SCANNER ONLY, 1D Laser, USB. Cables and accessories sold separately. Color: Black. 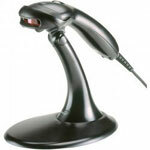 MS9540 Voyager, Includes CodeGate, HH Scanner and Low Speed USB interface. Color: Black. Scanner Only - Cables and accessories must be purchased separately. These include USB (Part# 53-53235-N-3), PS/2 (Part# 53-53235-N-3), or RS-232 Serial cables (Part# 53-53000-3) and a Power supply (Part# 46-00525). MS9540 Voyager, SCANNER ONLY, 1D Laser Scanner. CodeGate and Low Speed USB interface. Color: Light Gray. Cables and accessories must be purchased separately. These include USB (Part# 53-53235-N-3), PS/2 (Part# 53-53235-N-3), or RS-232 Serial cables (Part# 53-53000-3) and a Power supply (Part# 46-00525). Non-Cancelable/Non-Returnable. MS9540 Voyager, SCANNER ONLY, 1D Laser Scanner. IBM 46xx RS-485 Interface. Cables and accessories must be purchased separately. Color: Black. Non-Cancelable/Non-Returnable. MS9540 Voyager, RS-232 kit, 1D Laser. Includes RS-232 cable, power supply, and stand. Color: Gray. MS9540 Voyager, PoweredUSB is non-standard, please call for more information. IBM PoweredUSB kit: Scanner with CodeGate Trigger. 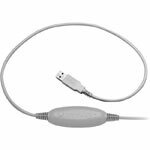 Stand and cable - Color: light gray. MS9540 Voyager, Single End PS/2 kit, 1D Laser. Includes single-ended PS/2 cable and stand. Color: White. We have a small office and wanted a scanner to enter customer bills. Easy to set up and use. Only issue I found was trying to identify the correct cable to use with the product. MS9540 Voyager has been cleared for takeoff! With a futuristic design and advanced scanning system, Voyager is the most advanced single-line, hand-held barcode scanner on the market today. MS9540 Voyager feature Metrologic's proprietary CodeGate technology. CodeGate is an intuitive scanning system that is ideal for all scanning applications, including menu-scanning, Point-of-Sale, document processing, and inventory, just to name a few. The MS9540 Voyager is packed with all of the same features as the MS9540, with the exception of CodeGate. Two Models, Great looks, Top Performance... MS9540 Voyager Scanners have it all!